The ancient science and art of Reflexology stimulates the thousands of nerve endings in your feet by applying thumb and finger pressure. Stimulating the nerve endings (the reflexes) stimulates the nervous system and all the other systems of the body – circulatory, respiratory, elimination, reproductive, lymphatic, muscular and skeletal – to improve your overall health and the health of your organs and glands. By interrupting and ultimately changing stress patterns, Reflexology provides deep relaxation, improved neurological functioning (focus/concentration/ creativity), and improved circulation. Reflexology treatments cleanse your body of toxins, enhance your immune system functions, and bring your body into a state of balance and harmony. 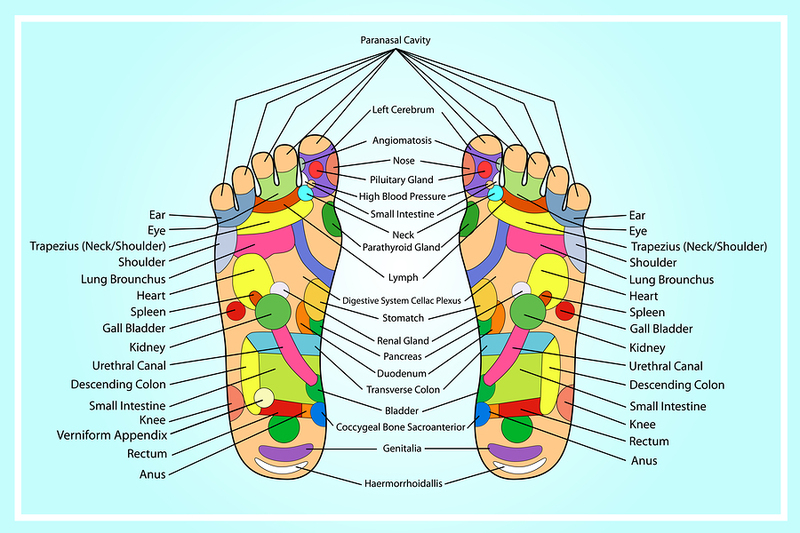 Reflexology is an ancient science and healing technique based on the theory that the 7200+ nerve endings in your feet directly correspond to all your organs, glands and body parts. In essence, your body is “mapped” onto your feet. By stimulating these nerve endings, ie: reflexes, with thumb and finger pressure, any energetic, physical and neurological blockages may be cleared, thus helping to restore health and equilibrium to the corresponding body part. This process of stimulating the reflexes, also increases ones circulation, it creates a deep sense of relaxation, and it releases stress and tension from the body. It is when the body is in this deep state of relaxation that the one can access their inner wisdom and heal. A Reflexology session commonly feels very nurturing, calming and restorative. As the reflexes will be sensitive if there is an imbalance, some people may experience some tenderness on different areas of the foot. The touch is adapted to each person and feedback is encouraged for your benefit and to create the most effective treatment for you and your goals for the session. The touch is firm, it is not usually perceived as ticklish and the relaxation techniques are soothing and relaxing. Who benefits from a Reflexology session? Headaches, Back /Neck/Shoulder pain, Diabetes – numbness in toes, circulation issues, woman’s issues – infertility, PMS, menstrual cramping, digestive issues, sciatica, respiratory issues – asthma, allergies, shallow breath, coughing/wheezing, heart conditions, sinus headaches and infections, ADD, ADHD, ear aches, vertigo, foot pain, fatigue and sleep disorders. Should I tell my doctor I am having sessions? It is always important to keep your doctor informed of your life style, your stresses, and how you take care of yourself. We are happy to communicate with your doctor (after signed authorization is received from you) on any areas of concern. It is never recommended that you stop or change any medications. We will advise you, that as your body receives these sessions and starts to normalize its functioning, you will need to closely monitor your medications, and pay close attention to how you are feeling. With the help of your doctor, you can determine if a change is needed and often less medication is needed as a result of this work. A session is one hour for an adult and 30 minutes for children under 12. The elderly will vary from 30 to 60 minutes depending upon their health. Backaches: apply thumb/finger pressure along the medial aspect of each foot, starting at the base of then big toe going down to the heel. Do this about 10 times and especially work the pressure points along this line that are most sensitive. Cold-head and/or chest: rub/press the balls of your feet with steady, strong thumb and finger pressure. Do the same to the upper portion of your pals just below the fingers. The feet are easier and it feels better as there is more padding.